Campaigners are calling on a council to halt the sale of land next to Britain’s second-biggest Iron Age hillfort. The land, at Cissbury, is within the new South Downs national park and was earmarked for sale after the death of its tenant farmer. The sale of the land, along the Tenant Hill ridge and on Mount Carvey, is being discussed by Worthing Borough Council today. The Open Spaces Society, which campaigns for rights of way and green spaces, called on the council’s cabinet to withdraw the land from sale. The OSS’s general secretary Kate Ashbrook said: “We have written to the leader, Paul Yallop, and the cabinet member for resources, Steve Waight, to say that, while we applaud the recommendation to withdraw the land for sale, we are concerned that the council is considering a policy of selling leasehold interests in its land, on the advice of ‘a prominent developer’. “We believe that would be the wrong solution for the Cissbury downland. The council must remain clearly in control and, unless there are clear caveats about how the land is to be managed, to secure public access and to protect and restore the landscape and its natural history, these downs will be lost the public and to future generations. “That would be ironic just as the area is confirmed as the South Downs National Park. The society has joined local residents and members of the Stop Cissbury Sell Off group to oppose the sale of the land. Ms Ashbrook continued: “The council is meeting the National Trust and the South Downs Joint Committee immediately before the cabinet meeting. But that does not allow for any effective input from that meeting to influence the cabinet’s decision, should the cabinet be minded to consider a leasehold arrangement. 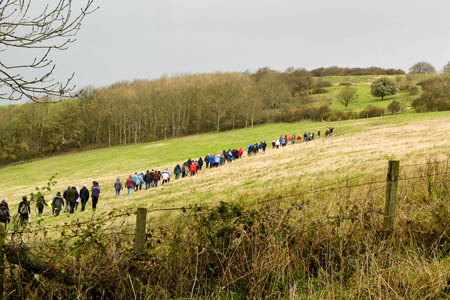 A review of open access land under the Countryside and Rights of Way Act is due to begin in 2012. Walkers’ groups are hopeful that much of southern England’s downland, excluded in the original maps of access areas, will be opened up for access in the process.